Cypress Grove Creamery’s Cheesemaker Mary Keehn started raising goats in the 1970s, but didn’t begin making her magic until 1983. Immediately, her passion turned into winning awards for now-famous chevre-based goat cheeses like Humboldt Fog, named after northern California’s weather phenomenon in Humboldt County. Today, to focus her energy on cheesemaking, she no longer raises the goats and the milk comes from local sustainable farms that partner with Cypress Grove. Her success has revitalized the farming community by creating opportunities for small dairies to thrive. The initial concept for her amazing Truffle Tremor, back in 2009, involved flavoring fresh goat cheese with truffles, but Keehn thought the truffle overpowered the young cheese. She felt the truffles pined for the complexity of a ripened cheese. So, like a great chef, she altered the recipe. To introduce the namesake umami-ness, Keehn experimented with a variety of truffle products, including truffle oil, before settling on a canned grated black truffle imported from Italy. So decadent you could eat it with a spoon, the soft, rich Truffle Tremor is tangy and pungent with mushroomy goodness. Rich, earthy notes of truffle combine with the milky, lush creaminess resulting in an intense yet elegant balance of complex, salty flavors. 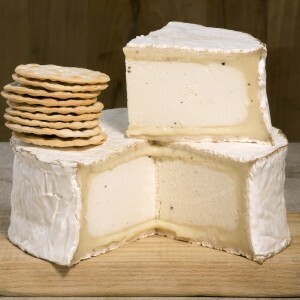 As the cheese matures (it gets released after three weeks of aging), the cakey layer becomes softer just under the rind (see picture), providing a more herbaceous flavor. If you’ve had Keehn’s Humboldt Fog, this takes that treasure to tremerous heights. Pair it: Crisp whites like Albarino or Pinot Gris and earthy, lighter reds like Pinot Noir. Buy it: Whole Foods across the country and online at reputable cheese shops like MurraysCheese.com. Never miss a single word on TaylorEason.com! Sign up for my newsletter.